Don't look now, Tony Parker, but it looks like your reign of best French NBA player might come to an end soon. Nicolas Batum has been one of the hottest players in many fantasy leagues, and he's quickly shown the Blazers what he can do in the starting lineup. No idea what I'm talking about? Take a look at his averages in the last 6 games since taking over as the starting shooting guard. 21.3ppg, 2.7 3s, 5.6reb, 1stl, 1.5blk while shooting 52% from the field, 46% from 3pt line, and 86% from the line. 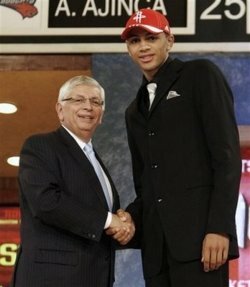 Back when the Blazers pulled the draft day trade in 2008 and pried Batum away from the hands of Daryl Morey and the Rockets by sending Donte Greene and Joey Dorsey to Houston, Portland thought they were getting a Rudy Gay-type of player in return. However, in Batum's first 3 seasons as Portland's starting shooting guard, he's looked to be another Thabo Sefalosha. Lanky, athletic, and a defensive specialist who can shoot the 3. In other words, a letdown. Batum was on the fast track to becoming just a "role" player in the NBA when coach McMillan moved Batum to the bench at the start of this season. Many will look at his current 6-game streak and call it a fluke. With career averages of roughly 9 points a game, Batum has not given us many reasons to believe that he can sustain this run. But if you look beyond the numbers, you will find that this kid's got heart. Playing in the last year of his rookie contract, Batum knows that this is the time to display his value. There are no more reasons to hold back. When the Blazers' franchise player, Brandon Roy, retired at the beginning of the season, it opened the door for a player like Batum to fill that void. A lot of credit goes to coach McMillan for moving Batum to the bench. Time spent on the bench has allowed Batum to mature mentally, and it shows in his game. On the Feb. 6th game against the Thunder, Batum's number got called for the last play to win the game. Batum made the smart play by driving for a lay up. However, he clearly shied away from the contact and flinched at the defensive presence of Russell Westbrook when all he needed to do was to rise up and dunk the finish to win the game. The Blazers would go on to lose the game in OT. This would become a pivotal learning moment in Batum's season. A week later, Batum faced a similar situation in a game against Washington. In his second appearance as a starter this season, Batum didn't shy away from NBA blocking machine, Javale "Future of the NBA" McGee. "Sometimes, in the past, I got a flash and I was more aggressive, I dunk on people," Batum said. "But I wouldn't do it every time. Sometimes I was worried about getting a block or a charge called on me. But now, sometimes I have to tell myself, 'OK, just go. Go and see what happens.' I've got to be aggressive every game. And now I know I can do it. I feel like a different player." Suffit d'aller, Batum, suffit d'aller. Photos and video courtesy of nbadrafthats.tumblr.com and youtube. I've always been a fan of Batum's game. Knew it was a mistake right away when Houston traded him for Joey Dorsey. His biggest attribute is his willingness to play defense. I love that about him and he's someone you would want on your team. Kept this guy this year again in fantasy! I never doubted he was going to break out =) what a auction draft bargain $3! Might've killed this column too.